LakeGrande is a brand new condominium fronting Jurong Lake, that will launch for sale in mid 2016. Less than 5 minutes walk from Lakeside MRT Station on the East West MRT Line. Its location on the doorstep of the Jurong Lake District, dubbed the “CBD of the West” carries a lot of growth potential, with the ongoing transformation of this area into the biggest commercial hub outside the Raffles Place Marina Bay CBD. Lake Grande condo is being developed by MCL Land, one of the most reputable developers in Singapore and Malaysia, with a long and established track record of quality developments. Its extensive portfolio of residential projects includes Lakeville (next door to Lake Grande), J Gateway @ Jurong East MRT station, the Hallmark Residences @ Bukit Timah, Palms @ Sixth Avenue, and Uber 388 @ Bayshore. MCL Land has a pretty solid track record in the Jurong area, of acquiring sites with good upside potential. J Gateway sold out within a day, and Lakeville has sold well too, with some unit types sold out, and limited numbers left of others. LakeGrande is even nearer the MRT station than Lakeville. Do arrange to view Lake Grande Jurong showflat if you would like to invest, or live here. Located less than 5 minutes’ walk to Lakeside MRT station, with views of Jurong Lake. On the doorstep of the Jurong Lake District, comprising the Jurong Gateway & Lakeside Precincts – a unique business, residential and leisure hub. 2 MRT stops to Jurong Gateway – the “new CBD of the West”, spanning 70ha of land around Jurong East Central that will cover more than 500,000 sq m of office space, over 250,000 sq m of retail & entertainment space, and more than 2,800 hotel rooms in the future; providing the necessary tenant pool for investors. LakeGrande condo is well served by shopping centres 2 MRT stations away, such as JCube, JEM, Westgate, Big Box, IMM, and Jurong Point. Within 1km to Rulang Primary School, and less than 5 minutes walk to the Canadian International School. Across the road from LakeGrande, the Jurong Lake Gardens offers outdoor activities & parks for sports enthusiasts and nature lovers. A lakeside village will be developed there too, as a sprawling shopping, dining, hotel and entertainment complex. One train stop away is the new world class Science Center, that will be sited next to Chinese Garden MRT Station. Easy access to major expressways like the AYE & PIE. LakeGrande condo is being developed by an established leading developer, MCL Land, a subsidiary of Hong Kong Land, with a proven track record of quality projects. Please register here if you would like to be kept updated on the Lake Grande @ Jurong Lake. Good chance for early birds to pick a nice view, if you missed out on Lakeville next door. This entry was posted in Lake Grande and tagged lake grande condo, lake grande jurong, lakegrande on January 8, 2016 by Reviewer. Lake Grande Jurong: In its April 2008 Master Plan for Singapore, the URA (Urban Redevelopment Authority) announced a blueprint to transform Jurong East and the Jurong Lake area into a unique lakeside destination for business and leisure over the next 10 to 15 years, making it the “CBD of the West”. This western CBD (Central Business District), called the Jurong Lake District, would comprise 2 precincts: Jurong Gateway and Lakeside. It would cover an area of 360ha (about the size of Marina Bay), making it the largest commercial centre outside the Raffles Place CBD. And it would be a test bed for the “intensive smart nation initiative” – the Jurong Lake District would be created as a smart community driven by intelligence, integration and innovation. Covering 70 ha around the Jurong MRT station, Jurong Gateway will be the biggest commercial hub outside the city, providing 500,000 sqm of office space with a unique lakeside setting. It will introduce a mix of office, hotel, retail, food & beverage (F&B), entertainment and other complementary spaces. Given its proximity to the IBP (International Business Park), research and educational institutions, and industrial estates, Jurong Gateway will be an attractive business address outside the city for company headquarters, companies in the science and technology sectors, and business services. 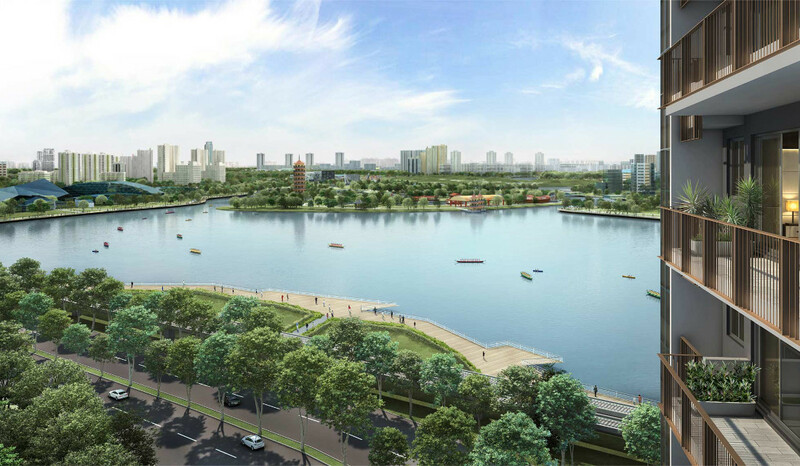 Lakeside will cover over 220 ha of land and 70 ha of water at Jurong Lake, opposite Lake Grande Jurong. It is being developed into a major leisure destination. Includes a new family-friendly waterfront park and promenade, more water activities, and several attractions with a scenic lakeside setting. The first anchor attraction is the upcoming world class Science Centre that will be relocated next to Chinese Garden MRT station. There are plans to build four to five other new edutainment attractions for the young. A new waterway will be added to bring the lake nearer to Jurong Gateway and create a lakeside village that offers a new dining, shopping, and entertainment experience, including F&B and boutique hotels by the waterfront. See URA website on the Jurong Lake District here (opens in new window). 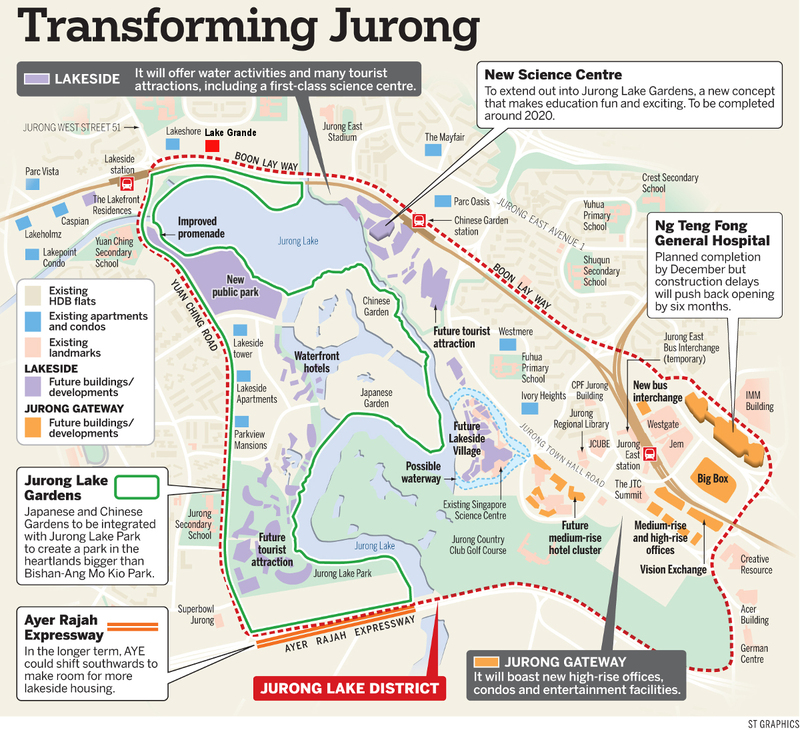 Since these bold plans for the Jurong Lake District were unveiled in the 2008 Master Plan, the transformation has begun. Large shopping malls such as JEM, Westgate, Big Box and JCube have come up, and see huge crowds daily. The Genting Hotel Jurong (“Hotel in a Garden”), the Ng Teng Fong General Hospital, and the Jurong Community Hospital, are now fully operational. All these have generated much excitement and buzz in this area, with strong interest in real-estate, including the one-day almost sell-out of J Gateway & Lake Life at their respective launches. This entry was posted in Lake Grande and tagged lake grand, lake grande condo on January 7, 2016 by Reviewer. Being revamped as a refreshing waterside park. 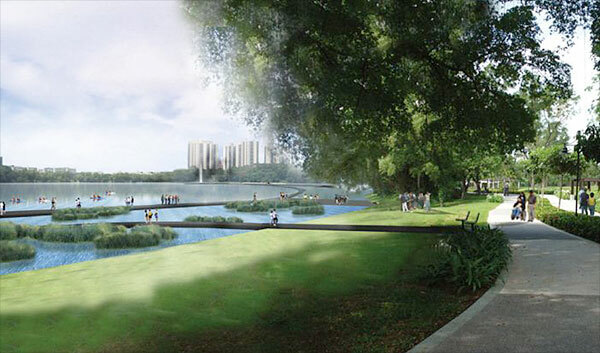 The new 60ha Jurong Lake Park will be a green sanctuary when it is completed around end 2016 or 2017. The presence of the lake offers a unique play experience, a waterfront playground. Comprising a sprawling adventure playground connected by different islands. Each filled with innovative play equipment in a natural setting. The 2.8km long water promenade and running track skirting the meandering shore of the lake is another attractive feature. Creates a pathway lined with greenery to soothe the frazzled soul. Boardwalk with Wetland Plants to help clean the waters of the reservoir lake. Enjoy the peace & scenery of Jurong Lake as you stroll or jog, or cycle along the waterfront. Set in extensive greenery & landscaping, complemented by roof gardens and sky terraces. See this report (opens in new window) on the development of Jurong as a jewel in the west. In a ground breaking move, JCH & NTFGH are the first hospitals in Singapore to be designed and built together from the start, as an integrated development that complements each other for better patient care, efficiency & convenience. JCH is twinned with NTFGH, so that patients who no longer need acute care, can recover in a setting that better caters to their needs. Designed to be eco-friendly. Internal hot water supply and landscape lighting to be powered by solar energy. Harvested rainwater will be the main source of watering for its rooftop gardens. Easily accessible, just a short walk from Jurong East MRT station and Jurong East Bus Interchange. An integrated healthcare hub that is also seamlessly connected to the surrounding shops, F&B, and entertainment outlets. Please register here if you would like to be kept updated on the LakeGrande @ Jurong Lake. For buyers looking for property in the west of Singapore, now that Lake Grande is sold out, the next possibility is the Dairy Farm Residence. This project is located in the Dairy Farm Road area, a private residential enclave. It is part of the Upper Bukit Timah area, that is home to a number of condominiums, and especially to pretty established landed estates. While Upper Bukit Timah is sort of considered a poorer cousin to the part of Bukit Timah nearer to Newton, it is nevertheless still a very pleasant place to stay in. On top of that the Dairy Farm Residences units enjoy unblocked views of Bukit Timah Hill and Nature Reserve. The only drawback of this location is that it is not very close to an MRT station. The nearest MRT station to the Dairy Farm Residence showflat location is Hillview MRT station, that is roughly 13 minutes walk away. And the nearest mall to the site is a small one, the Rail Mall. It does offer quite a selection of shops and cafes though. This entry was posted in Lake Grande on January 6, 2016 by Reviewer. MCL Land (Vantage) won the Urban Redevelopment Authority (URA) land sale for the Lake Grande launch site with an offer price of $338.1 million. This works out to $630.13 per sq ft (psf) of gross floor area for the land alone. Chinese developer Hao Yuan’s unit, HY Realty came in second with a $317.9 million bid, just 6.4% lower. URA announced the results of the land tender on 11 March 2015. A total of nine developers made bids for this 99-year leasehold site at Jurong West Street 41, about 350m from Lakeside MRT station. The “healthy” number of bidders shows there is still good demand for attractive sites, said Mr Desmond Sim, CBRE research head for Singapore and South-east Asia. This is especially since the number of condominium sites under the Government Land Sales Programme is being reduced, he noted. JLL’s national research director, Ong Teck Hui highlighted that the Lake Grande site has good views of Jurong Lake and is near Lakeside MRT station. 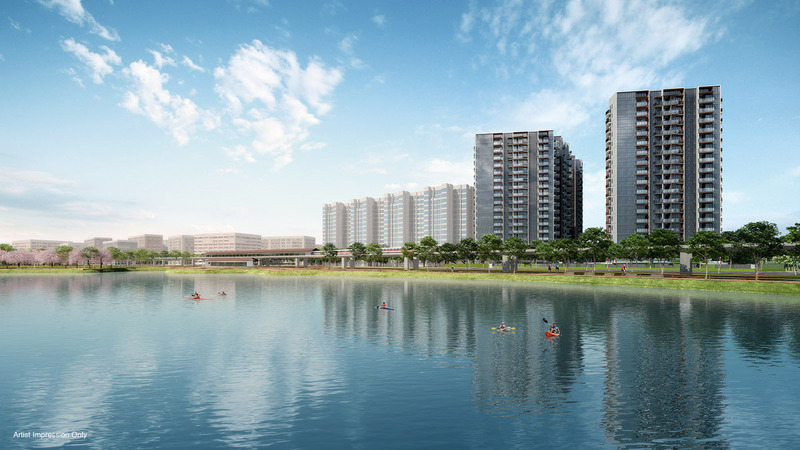 MCL Land’s winning bid for the Lake Grande site can be traced to its confidence in the Jurong property market, given its successful launch of 2 residential projects in this region in the last 2 years. MCL’s top bid is just 3.2 per cent less than its S$651 psf ppr winning bid in 2013 for the next-door site, which it is developing into Lakeville condominium. Assuming construction + overhead costs of around $400 PSF, break-even cost for the Lake Grande launch could be approximately $1,050 PSF, and selling price could be around $1,350 PSF. Mr Ong Teck Hui also cited Lakeville’s estimated average price of $1,325 psf as an indication of the possible pricing for the Lake Grande launch. MCL has sold over 80% of the 696 units at Lakeville next door, at an average of $1,325 PSF (and this is after the last and most effective round of cooling measures). Before that, MCL quickly launched and sold out nearly all its 738 units at the J Gateway launch at Jurong East MRT station, at an average $1,480 PSF, on the evening just before the TDSR cooling measures took effect. 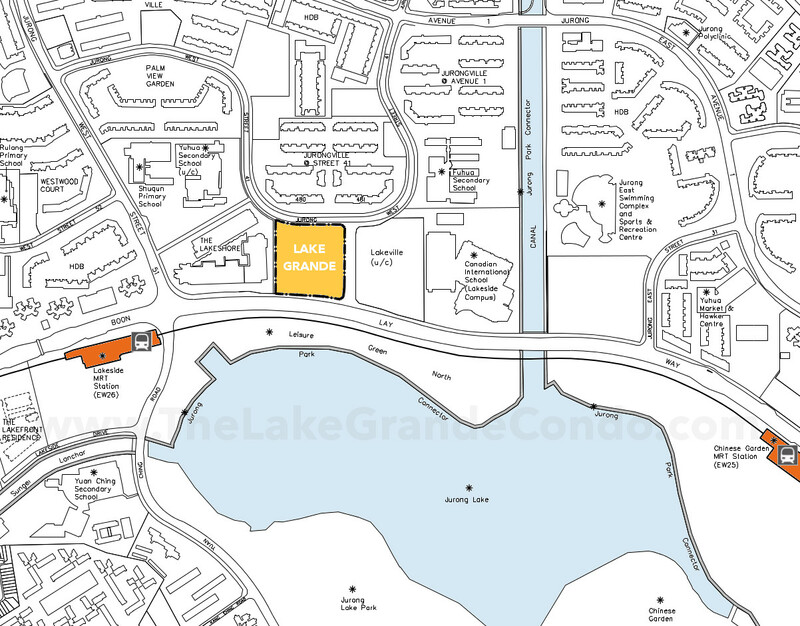 Please register here to receive updates on the Lake Grande launch pricing once available. This entry was posted in Lake Grande and tagged lake grande condo, lake grande pricing on January 6, 2016 by Reviewer. How would you like to travel from your LakeGrande condo home to KL in just 90 to 100 minutes? That is a real possibility now following the announcement by both countries in February 2013, that the much anticipated Singapore-KL High Speed Rail (HSR) was on the drawing board. Subsequently on 5 May 2015, Prime Minister Lee Hsien Loong announced that the Singapore terminus for the 350km HSR would be located at Jurong East. It was also stated that Jurong East was chosen as it dovetails with Singapore’s plans to transform this area into a 2nd Central Business District (CBD). The HSR completion date is not finalised yet, but it could be somewhere around 2015. The actual site of the terminus will be where the Jurong Country Club is now. This plot of land is near the Jurong East MRT station, 2 stops down from the LakeGrande condo site. So with the Singapore-KL High-Speed Rail station only 10 minutes or so away, getting to Kuala Lumpur will take less than 2 hours. You could possibly zip up there to enjoy lunch or a business meeting, and be back in time for tea, or for further meetings back in Singapore, and comfortably home for dinner. 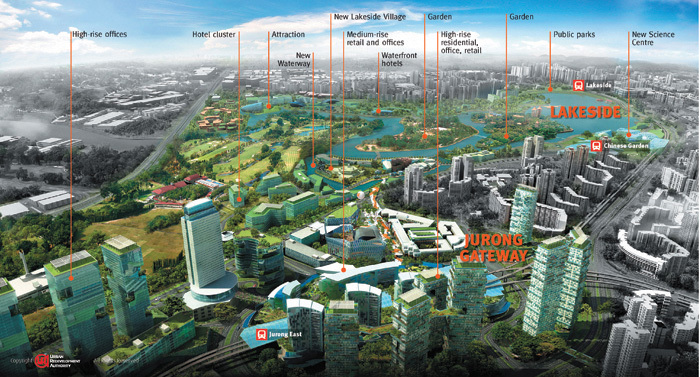 The locating of the terminus in Jurong East has brought with it a buzz, a sense of optimism, and enhanced interest to the Jurong property market. As a regional centre and the CBD of the west, Jurong East by itself is already a very attractive location for investors. Now, with the added benefit of the HSR terminus here, it is undoubtedly one the most attractive investment areas, with exciting prospects of growth & capital appreciation in the future. Please register here if you would like to be kept updated on the LakeGrande Condo. By MCL Land (Vantage) Pte. Ltd.